Categories: Domestic Adoption, How to Adopt Domestically, About Adoption, How to Adopt, Making the Decision. 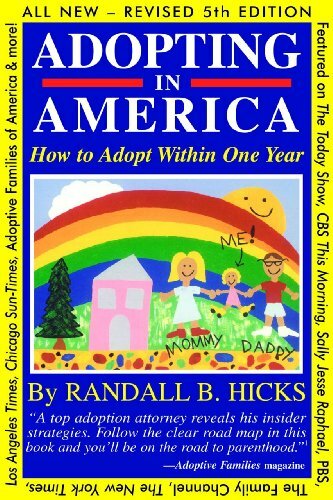 Authored by one of the nation’s leading adoption attorneys, ADOPTING IN AMERICA is the ultimate “how to” book for anyone thinking of adopting. Written in a clear style, it details every type of adoption. This includes not just the standard types (domestic independent, agency and international) covered in other books, but a total of 14 subtypes, including little-known options like non-resident adoption, permitted in 26 states. (These states allow adoptive parents from other states to complete their adoption in their state even though the adoptive parents don’t live there, if the minor is born there. This gives adoptive parents greater flexibility to complete their adoption in a state with more favorable adoption laws, procedures and options than their home state.) Particular attention is given to the adoption desired by most adoptive parents: a healthy newborn, including how to network for, and be selected by, a birth mother. The book also includes: Special strategies for success in adopting quickly (particularly when seeking a newborn adoption) known only to top adoption attorneys; a review of key legal issues and how to navigate them safely; how to spot red flags to a risky adoption; how to select the best adoption agency or attorney; how to obtain free medical benefits for the baby; the federal adoption tax credit of $12,650; a review of each state’s unique adoption laws, with biographies of each state’s members of the American Academy of Adoption Attorneys (over 300 nationally). There are also sample photo-resume letters and networking cover letters. Includes detailed appendices and index.